Following two previous Contracts awarded to MINO at the beginning of 2016 for the supply of two strip processing lines, Profilglass has now awarded MINO with a further Contract! The new Contract covers the supply of a state-of-the-art, wide strip, Six-high Cold Rolling Mill having an impressive barrel length of 2500 mm. Through this new investment Profilglass aims to serve the most highly demanding industrial sectors (including the car industry) with top quality aluminium alloy strip of AA1xxx, AA2xxx, AA3xxx, AA4xxx, AA5xxx and AA6xxx, up to the maximum widths today required by such markets. The new Six-high Mill for Profilglass will be capable of rolling aluminium alloy strip having a maximum width of 2350 mm, down to a minimum gauge of 0.2 mm, and will be one of the biggest cold rolling mills for aluminium in Europe. The new Six-high Mill is of state-of-the-art design and includes entry side trimmer & scrap chopper, EDT pass capabilities, off-line entry coil preparation system, off-line exit coil inspection system, automatic spool transfer device, most advanced AGC/AFC controls and powerful medium voltage AC main drives . The Mill stand is equipped with MINO’s long stroke shifting system for the intermediate rolls, allowing a huge range of different products to be rolled successfully, coping with a big variation in product strip width and diverse mechanical characteristics of the different alloys being rolled. 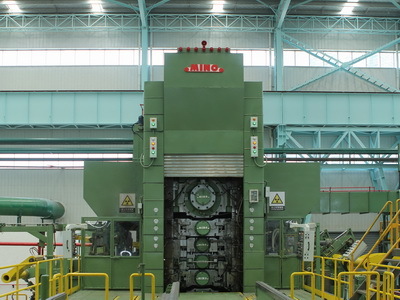 MINO has addressed the problem of heat build up in the coils following subsequent rolling passes, by replacing the traditional coil transfer carrousel (floor mounted, pallet type) with a “High Bay” automatic coil storage system, fully integrated with the Mill, having a capacity of 200 coils. 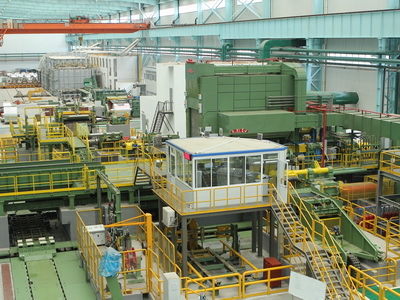 An innovative characteristic of MINO’s High Bay System is that the automatic tracking of the coil and its transfer through the cold rolling process is fully integrated with the Mill’s level 2 automation, where the “recipes” for each product are fulfilled not only in terms of the rolling mill set-up, but also in terms of coil handling and cooling time between passes. The scheme is being developed by MINO Automation in cooperation with its US partner company Janus Automation, experts in coil handling and logistics management. - a complete Continuous Tension Levelling, Cleaning & Passivation Line. MINO is particularly proud of the consolidated and long-lasting partnership established with this Customer back in 2001 (when Profilglass awarded to MINO the first Contract for the supply of a Cold Mill) and which has continued uninterrupted through the years, following the spectacular growth of Profilglass in the aluminium strip sector.